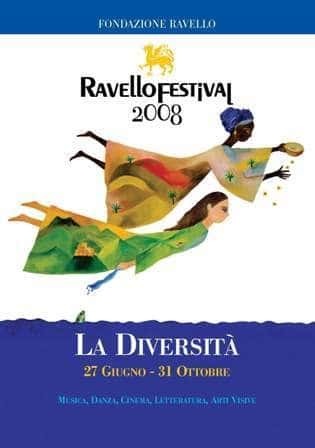 The 2008 edition of Ravello Festival begins on June 27th and ends October 31st. The leitmotiv characterizing the about 200 events, divided into 8 artistic sections is the concept of Diversity. The Belvedere rostrum, in Villa Rufolo is ready for the inauguration day, when, the Basque conductor Inma Shara (yet protagonist of last year's inauguration) will conduct the Prague Philharmonic Orchestra, with Evelyn Glennie at the drums. Thanks to an agreement with the San Carlo Theatre in Naples, the "Orchestra del Massimo Napoletano", conducted by Jeffrey Tate and Ascher Fisch, will perform two concerts. On San Lorenzo Night (10th August) the "Concerto all'alba" will be performed by the New Scarlatti Orchestra, conducted by Aurelio Canonici. On September 6th Uto Ughi will be in concert. After Maurice Béjart, Bill T Jones, Roberto Bolle and Alessandra Ferri, Martha Graham and Josè Limon will perform their dancing show called "Man and Woman In Modern Dance". Among the many protagonists Ravello Festival will also host the jazz player Uri Caine, the pianist Ludovico Einaudi, the composer Wim Mertens, the Stuttgart Ensemble performing Sciarrino's latest composition, the writer Andrea de Carlo (this time performing as a guitar player) and the Vienna Vegetable Orchestra, performing in Campania with musical instrument made of peppers, courgettes and cucumbers. Massimo Ranieri, together with an arc quartet, will present his new show, with traditional Neapolitan songs. Tony Servillo and Catherine Spaak will also be on stage. From June 27th until August 27th, the Perna Foundation will exhibit the works by 18 Mediterranean artists, selected by the foundation itself and by its scientific committee. The committee will be supervised by Achille Bonito Oliva, the curator of the "Intolerance" exhibition, focusing on contemporary art, conceived as coexistence of diversities. For what concerns literary and training meetings, we would like to remind you two events: first of all the "Tea with the author", hosting the last five finalists of the 2008 Campiello Award, and the summer seminar, organized by S3.Studium, hosting Remo Bassetti and Alessandro Cecchi Paone, who will analyse the theme of diversity. October will be entirely dedicated to a series of meeting and exhibitions dealing with new trends in art and music.